On Christmas Eve, four of Kansas City’s finest chefs gathered in a secret underground Elf Testing Kitchen in the Crossroads. It was a special Christmas present for 20-year-old foodie Dylan Wilkerson, who has persevered through a lifetime of illness that would crush most souls. But not Wilkerson. And to honor him, the dinner was in the spirit of “A Christmas Carol,” with three chefs creating dishes to represent Christmas past, Christmas present and Christmas future. The gift was from the Elves of Christmas Present, an anonymous group that for more than 20 years has created special Christmases for families having a hard year. So it was that chefs and assistants and one new Elf, a dinner-club organizer, stood before ovens and sinks in a Crossroads loft, cooking and stirring, tasting and cleaning, waiting for the guest of honor to arrive. 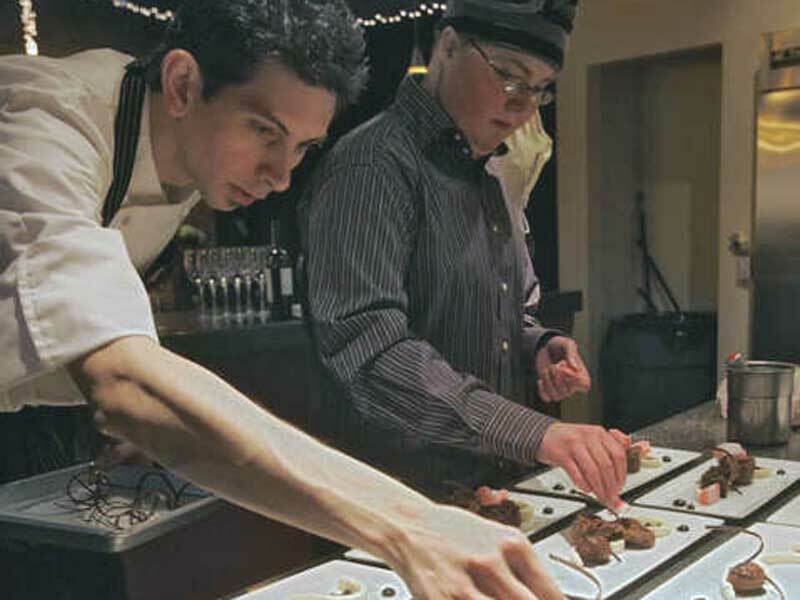 “Look at my hands,” said chef Jonathan Justus of Justus Drugstore. Creating an entrée for Christmas past, he had harvested a pine-needle cucumber from his garden, and was shaving shards of duck breast on the plates alongside brioche toast dusted with vanilla black pepper. Chef Celina Tio, owner of Julian, was in charge of Christmas present. She was wiping pans and tasting her entrée, a thyme-basted beef with parsnip puree. A bottle of sherry was nearby, waiting to glaze some pearl onions. It was the same dish she prepared for the “Iron Chef” cooking show. “I thought Dylan might enjoy critiquing it, too,” she said. Huddled over some melted white chocolate bark were chef Debbie Gold and pastry chef Nick Wesemann of The American Restaurant. They were in charge of Christmas future. Desserts with a modern flair. The two were designing a confection of peppermint, chocolate mousse and white chocolate. “Basically, we’re adding them together, then mutilating them,” Wesemann said with a grin. They were “baking” cake batter in paper cups in 30-second increments in a microwave, and then using a fish filter to foam up a butter sugar sauce. “Yeah, I remember as a kid we were the first on the block to get a microwave. My mom tried to bake a birthday cake in it. … So here I am, full circle,” Gold said. The “Christmas Carol” theme would not be complete without the ghost of Marley, known in regular life as chef Jasper J. Mirabile Jr., owner of Jasper’s. He wore a costume provided by the Kansas City Repertory Theatre, a black vest over a white puffy shirt with ruffles (very Seinfeld-ish). Mirabile greeted the family at their Parkville home and accompanied them in a limo to the loft. Mirabile said he was 5 when he knew he wanted to be a chef. Dylan’s family wasn’t sure he would make it to age 5. Born with only half his heart working, he had surgery as an infant and a pacemaker installed when he was a toddler. He developed a disease that prevented him from absorbing proteins. He’s had numerous staph infections, skin problems, swollen legs, low blood counts, anemia, fatigue. Last year he went through a heart transplant in St. Louis. Then his doctors found cancer, so he went through rounds of chemo to purge cancer cells in his lungs and brain, and it worked. Recently, more cancer started growing in his jaw. But it too is responding to treatments. Wilkerson has been tutored all his life. Homebound with illness. Isolated from other children. But he found a talent. He discovered that he loved watching food shows. Chefs were so friendly and creative. Their passion was contagious. “Dylan would watch them create something like jambalaya and then try it himself,” said his mom, Cynthia Bjorn. She and he played together in the kitchen, creating and tasting and trying new ideas, because it was fun. And healthy. Dylan was 8 when he made his first pizza from scratch. A special recipe he altered because he couldn’t eat cheese, or tomatoes. His dishes tasted good, too, his mom said. And then Dylan’s palate began to crave more distinct textures and flavors. Somewhere in his growing up, he became a gastronome. And he began to nurture a dream of being a food critic. At 3 p.m. the family arrived to a table that seated 12. Waiters took their coats and brought out wine paired with each course. Hostesses served bread created by Suzanne Frisse of Meadowlark Acres. Breads made with grapes, some with olives. Dusted with sea salts and spices. Under the glow of Christmas lights, Dylan couldn’t stop smiling as each dish was presented. His mother’s face was soft in the light, her eyes shining. “Dylan has taught me that the most important thing we can do is to live in the moment,” she said. That’s the real gift of life. And creating, tasting and enjoying food is a perfect example of living in the moment. “The pain always comes when a worry pops up, about me imagining something bad in the future,” she said. The chefs watched Dylan as he ate, smiling themselves when he smiled or reached for a second helping. Dylan Wilkerson will be a food critic on the KCPT show “Check, Please,” hosted by Doug Frost.